Stob I have started testing techie podcasts at getting up time, as Brexitless alternatives to radio. CppCast: the show that proves beyond all doubt that C++ is not a spoken language. Plot: each episode, the two anchors interview an expert guest. Resulting conversation has a curiously dead atmosphere, especially between its co-hosts, possibly because one of them seems to be skyping his contribution in from some distance. Preferred Intensifier: "super", as in "the new Clang compiler is super fast". Emergency comment used when guest has been particularly obscure and/or incomprehensible: "Interesting". Extra feature: Sponsor's message read out with formidable woodenness. The spirit of the idealistic, commerce-free Internet lives on here. Plot: Chantasic interviews one guest per episode; often a speaker captured from a programming conference. Preferred Intensifier: "super", often modifying "awesome", as in "React's new hooks are super-awesome". Adjective used to warn off interviewee veering into particularly dull territory: "Interesting." Valley of Genius: the core of this is a series of interviews of with "the hackers, founders, and freaks who made Silicon Valley boom" (sic), which author Adam Fisher recorded while researching his eponymous book. The podcast pushes the book relentlessly. The real star of the show is not Fisher, nor yet Woz (or whichever specimen of Valley Royalty is the week's subject), but the show's official host, one Leo Laporte.Laporte's voice is as pleasing and mellow and warm as your grandmother's mahogany radiogram relaying the Home Service - supposing that instrument were in the habit of inhaling a dozen or so old-fashioned combustible cigarettes every day. I particularly admire his Troy McClure-ish plug for his other podcasts, which top and tail every instalment. Bonus treats: Fisher's interviews were evidently not recorded with rebroadcast in mind. A recent one featured the subject unexpectedly and noisily stuffing his face with food halfway through an answer. And an earlier sample, which our hosts assured us was captured in the lee of a playing fountain of a delightful water-garden, has the exact same acoustics as the washbasin area of a public lavatory. Was that little splash the sound of cavorting water fowl? No. it was not. On Black Friday, like many a sucker with a Prime account, I bought a brace of 0.5TB SSDs to use as speedy boot drives, replacing the spinning rust in my domestic Windows PC and my Mac Mini. Today I finally got round to installing the PC's drive. A few hostage-grade cable ties. Screw SSD into mounting kit frame using absurdly dinky screws. Open PC case. Pull out drive chassis thing. Discover bolt holes in mounting kit don't line up with chassis, 'cos it's the wrong type. Who knew there were multiple types of chassis? What madness is this? Get idea. Thread cable ties through misaligned holes and tighten, thereby attaching drive firmly. Guiltily thrust drive trays back inside PC case, in manner of one sweeping dirt under corner of mat. Plug in power and SATA leads and switch on machine. Drive is recognised! Caper about room congratulating self on own ingenuity. Of course, I haven't actually got the machine to boot off its new drive yet, but how hard can that be? Later: harder than I thought. Do NOT use Samsung's own program for boot disk cloning, as it barfed at copying locked files and, therefore, the registry. Get a trial version of Macrium or Acronis instead. Genuine tip. Played Words With Friends on my phone through lunch break. I currently have nine games on the go and I am losing in eight. Ninth is with an American doctor friend whose sense of pity has, I suspect, overwhelmed her formidable vocabulary. Medics have a natural advantage over techies in scrabblish games because much of their professional jargon has entered mainstream dictionaries. The correct term for a transverse fracture of the upper ulna - which natch I don't know, prolly "GLAVIP" or "LUJ" - provides them with many opportunities to unload the spikier consonants and less helpful vowels. But just try playing TRANSPILE or even GREP and see how far you get. Should have heeded Mama's warning: never play doctors and nurses. This code satisfies the key requirement of a random number generator, viz it came back with a different number quite often. However, over the years, notorious algorithmic busybodies have raised piffling statistical objections to this sort of thing: the sequence repeated itself too quickly, the spread of numbers wasn't uniform, it was impossible to hit certain values, some seeds would "jam", yada yada yada. Anyway, my colleague X had yielded to peer pressure and forsaken the simple pleasures of rand() and srand() and upgraded some of his code. Which I have just reviewed. Turns out he was unlucky in his choice of StackOverflow-cribbed fragment. His routine accidentally calls the reseeder for every number produced. So he's generating properly-random numbers, instead of pseudo-random numbers. This is a disaster. Large quantities of unused entropy are being venting directly into the environment. We are in Hitchhiker's Guide territory. Suddenly the state of the British political system becomes comprehensible. Still losing all my WWF tournaments. Am now additionally being beaten by my niece AP, who is armed with a formidable list of permitted dirty words. Thought I would force her into a QI cop-out with just "IMQU" left to get out, but was proved quite wrong. The game's British dictionary is apparently much more robust (== filthier) than the US dictionary, which discovery makes me feel curiously proud and patriotic. Another thing. About six months ago, They changed the caption on all the software's acknowledgement buttons from the stolidly neutral "OK" to the inappropriately Tiggerish "GREAT!". It is not GREAT! when I am forced to admit to yet another rout. Nor is it GREAT! that I have completed the challenge to get a Bronze Mystery Box and special badge, or the other ridiculous trinkets now annoyingly added to the game. I fancy this open enthusiasm is a US-led affliction. I am born of Midlands stock, and among my relatives, back in the old days, the preferred method of acceptance of, say, a slice of delicious chocolate cake was to mumble "I don't mind" in a barely audible monotone. I am still not really comfortable giving an acknowledgement any warmer than this. WWF's creator should do more to reach out to its multi-cultural audience. Multiple dictionaries are not enough. There must be a setting to change all the OK buttons to If you must. And if this doesn't happen, I may have to sigh quite deeply. There. Ok, can't put it off any more. Time to install the new drive in my Mac Mini. Extra set of spudgers or spludgers (the correct term), because somebody on the Net said I should, ordering another kit excused further delay, and because I like the word "spudger" or "spludger". 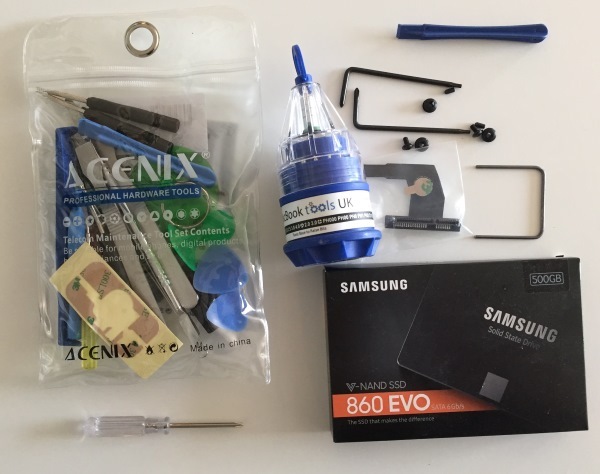 Three or four instructional YouTube videos, and the iFixit guide, comprising 37 (thirty-seven!) steps. The whole of Sunday afternoon. Turn the Mac over and, with a cautious delicacy that professional bomb defusers would surely envy, unscrew the circular plastic hatch to access the computer's penetranium (not the correct term). Examine the closely-packed components inside with horror. Discover, on the aforementioned iFixit reference, a hidden punter-editable area attached to each step, where previous journeyers down this peril-strewn path can - and have - recorded their fatal blunders. One slip of the spludger (or spudger) and you'll be needing a new friend to Xcode with. Reflect that, actually, a fast data drive in the PC could be really useful. Just saying. Screw cover back on Mac. Place spudgers and spludgers in special drawer reserved for disappointing surprise presents for the children of people you don't like.